As with any wild animal, confrontations with snakes should be avoided to ensure personal safety. That's why the Rocky ProLight Waterproof Snakeproof Hunting Boot was designed— to protect against most North American snakes; including rattlesnakes, copperheads, and coral snakes. 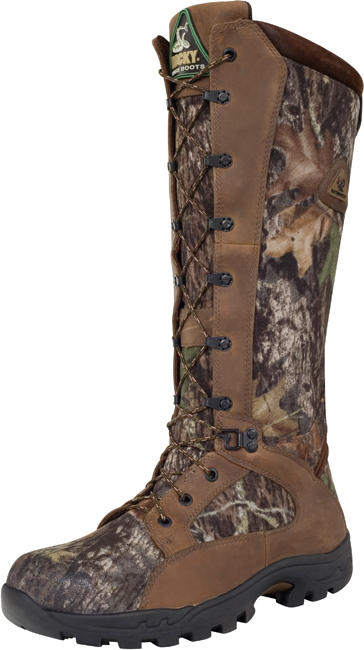 There are 16 inches of Snake proof protection on these hunting boots. Additionally, a full-grain leather trims the Mossy Oak camouflage nylon, a material that reinforces the Guaranteed Rocky Waterproof construction. So your feet will stay dry in any condition. With each step, the ProLight BioMech outsole provides traction on rugged terrain. It's made of a PU/Rubber outsole, which is an added layer of defense against soggy feet. This snake proof boot features everything you need to stay out of harm's way! This product is built with quality waterproofing materials to keep you dry in wet environments. Rocky Water proof construction insures the highest level of waterproof construction while maining breathability.